In what could be the next Obamacare case to go before the Supreme Court, an appeals court ruled today the Little Sisters of the Poor must comply with the health care law’s contraception mandate and allow employees to have access to coverage of contraception and abortion-inducing drugs. 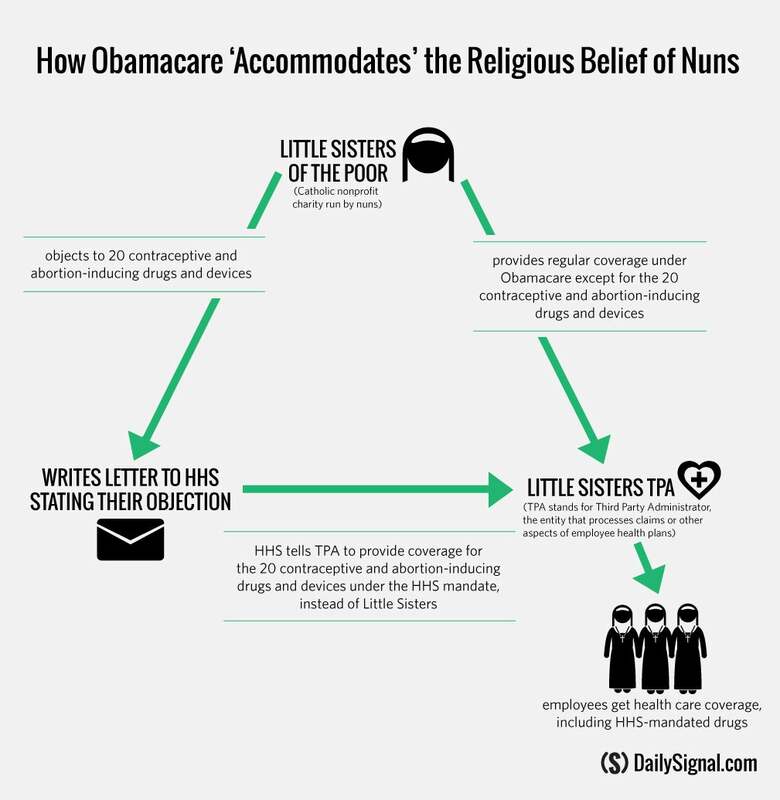 The U.S. Court of Appeals for the 10th Circuit ruled today that Little Sisters of the Poor, a nonprofit religious organization which serves the elderly worldwide—and four Christian universities in Oklahoma joining them in the suit—must abide by Obamacare’s contraception mandate. “Although we recognize and respect the sincerity of plaintiff’s beliefs and arguments, we conclude the accommodation scheme relieves plaintiffs of their obligations under the mandate and does not substantially burden their religious exercise under [the Religious Freedom Restoration Act] or infringe upon their First Amendment rights,” the judges wrote in their ruling. The accommodation scheme requires religious organizations that object to the contraception mandate to notify the Department of Health and Human Services of religious-based objections. The government will then notify the insurance company or third-party administrator, which then provides coverage directly to the employees. Last week, the Obama administration released its final rule for the accommodation scheme. “The departments have made opting out of the mandate at least as easy as obtaining a parade permit, filing a simple tax form, or registering to vote—in other words, a routine, brief administrative task,” the court said in its ruling. Little Sisters of the Poor provides employers with insurance through the Christian Brothers Employee Benefit Trust and Christian Brothers Services. The Little Sisters care for more than 13,000 elderly poor in 31 countries. In responding to the accommodation scheme, Little Sisters of the Poor argued that participating in this “contraceptive delivery scheme” made them complicit and thus violated their religious beliefs. Instead, the group sought to be treated the same as houses of worship, like churches, which can exclude contraceptive coverage from insurance plans. The appeals court ultimately rejected their argument. Just one judge on the three-judge panel dissented. 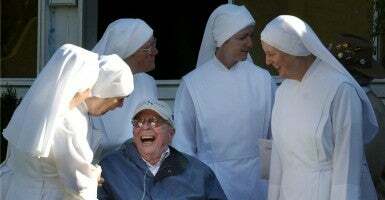 The Little Sisters of the Poor must now comply with the contraception mandate, pay the fines to the Internal Revenue Service or apply for an exemption from the Department of Health and Human Services. The mandate requires employers to provide workers with health insurance plans that cover contraception and abortion-inducing drugs. Organizations that don’t comply are forced to pay a penalty to the Internal Revenue Service. Religious groups protested the contraception mandate, arguing that providing contraception and abortion-inducing drugs violated their beliefs. The Little Sisters of the Poor estimated that refusing to abide by the mandate would cost the nonprofit $2.5 million per year in penalties. “It is a national embarrassment that the world’s most powerful government insists that, instead of providing contraceptives through its own exchanges and programs, it must crush the Little Sisters’ faith and force them to participate,” Mark Rienzi, a lawyer with the Becket Fund for Religious Liberty who represented Little Sisters of the Poor, said in a statement. 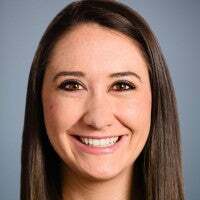 “Untold millions of people have managed to get contraceptives without involving nuns, and there is no reason the government cannot run its program without hijacking the Little Sisters and their health plan,” Rienzi continued. The 10th Circuit’s ruling comes after U.S. Supreme Court Justice Sonia Sotomayor issued an 11th-hour temporary injunction protecting Little Sisters of the Poor from enforcement of the HHS mandate just before Jan. 1, 2014. Then, weeks later, the high court granted the group an emergency order of protection while they appealed the case at the 10th Circuit Court of Appeals. Little Sisters of the Poor is deciding whether they will take the case to the Supreme Court. “We will keep on fighting for the Little Sisters, even if that means having to go all the way to the Supreme Court,” Daniel Blomberg, a lawyer at the Becket Fund, said in a statement. The circuit court’s ruling comes one year after the Hobby Lobby case, in which the Supreme Court ruled that businesses with religious objections to the contraception mandate can opt out of it.